Nickelodeon's beloved preschool characters are heading onto DVD for a collection of outdoor adventures in Nickelodeon Favorites: Great Summer Campout!, available June 12. 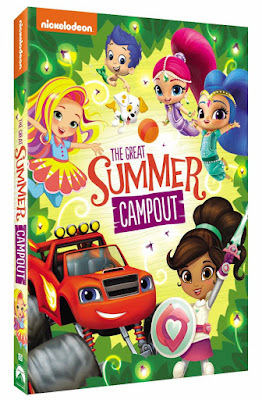 Filled with episodes from popular preschool series Bubble Guppies, Shimmer and Shine, Blaze and the Monster Machines, Sunny Day and Nella the Princess Knight, fans can join their favorite friends for sleepovers, camping, summer celebrations and more. Produced by Nickelodeon Home Entertainment and distributed by Paramount Home Media Distribution, Nickelodeon Favorites: Great Summer Campout! will be available on DVD June 12 for the suggested retail price of $10.99. Bubble Guppies: The Summer Camp Games! - The Guppies celebrate summer with fun-filled outdoor activities and Gil must use his camping skills to rescue Bubble Puppy during the Summer Camp Games. Shimmer and Shine: Treehouse Retreat - Zeta's relaxing night at a treehouse is disrupted when the girls also show up. Blaze and the Monster Machines: Truck Rangers - Blaze and his friends join a scouting club where trucks earn badges for their accomplishments. Sunny Day: Wild Styled - When Blair gets lost on a camping trip, Sunny and Rox must use their styling tools and skills in unconventional ways to save her. Nella the Princess Knight: Dueling Sleepovers - Nella and Trinket accidentally agree to attend both Garrett and Minatori's sleepovers on the same night. Win: One lucky winner will receive a copy of Nickelodeon Favorites: Great Summer Campout DVD! To enter, comment on which of the above is your child's (grandchild's, niece's, nephew's, etc.) favorite series! The deadline for entries is June 13, 2018 11:59pm HST. If you submitted an eligible entry and it is chosen by random.org as the winner, you will be notified via email on or about June 14, 2018 (make sure your email address is in your profile or comment and be sure to check your junk/spam, etc. folders) and will have 3 days to respond. My nephew's favorite is Blaze and the Monster Machines. My nieces like Shimmer and Shine. Shimmer and Shine is my daughters favorite! "Shimmer & Shine' is my child's favorite. My kids like Bubble Guppies. My niece loves Shimmer and Shine. shimmer and shine is my daughter's favorite. My daughter's favorites are Bubble Guppies and Shuimmer and Shine. The little one love Bubble Guppies! The favorite is definitely Shimmer and Shine! Thanks so much for the chances to win. My daughter's favorite is Nella the Princess Knight: Dueling Sleepovers. Thanks for the giveaway! My granddaughter loves Shimmer and shine and Bubble Guppies! My grandchildren would be absolutely love the cool Bubble Guppiesseries. I have grandchildren that definitely like very amazing Shimmer and shine series. My nephews and nieces would really be marvelous and great Blaze and the Monster Machines series. I have nieces and nepbews that really enjoy the fabulous .Nella the Princess Night series. My many children just like the awesome and lovely Shimmer and Shine series.